Nugget rolls $4.50 and $1 Toasties!! Also on offer this week Bakery pies and pasties $5 and sausage rolls $4.50. Finish it off with a $2.50 donut! Club Canteen will be open before and after training for the next two Saturdays. The 2019 SA Lifesaving Events State Championships consists of events such as R&R, Champion Lifesaver and Champion Patrol. Semaphore Juniors are proud of its history in supporting this event across the entire season carnival season. This year was no different with four Under 11 teams, and nine Under 13 teams entered in 2 Person and two Under 13 teams entered in 5 Person. Additionally from our Youth group we had one Under 15 team entered in 2 Person and one Under 15 Team (composite with West Beach) in 5 Person. Bronze Medal – Sam Jarvis, Tylor Richards, Jake Andrews, Tom Short, and Aiden Hall. We had three entrants to Champion Lifesaver this year all finding success in their respective categories. Ella’s (pictured left below) Gold Medal allows her to enter this competition at the Australian Surf Life Saving Championships in Queensland in April. We wish her luck with all her endeavours at Aussies. 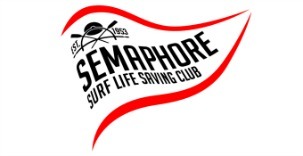 Congratulations to all our entrants across these events for proudly representing Semaphore SLSC. Team A from 11am and Team B at 12pm. At the present stage there is no released schedule for Sunday, however State Center has advised that due to tides & length of time taken to complete certain events it is anticipated that the Board Rescue events for U12 & U13s will be first up on the program in the water whilst the younger age groups have the distance run. The finalised schedule should be released on Thursday 21st Feb and will be communicated via E-mail. Water Cover is required for Day 1 – we must have 2 on duty (1 bronze, 1 SRC) at all times. To see the post on Semaphore Gold click the link below. ‘Semaphore Gold’ endurance event will be run on Sunday March 3rd. Competitors are asked to nominate via the link below. On the day sign in will be from 9:30am with events starting at 10:30am. No nominations will be taken on the day, you must nominate via the link above to be eligible to sign-in. Water Cover will be required on the day so please nominate to Paul on 0459442802. Without sufficient Water Cover the event cannot proceed. The Members Draw jackpots again this week & is now worth $600. This week’s draw will be held at around 7.15pm on Thursday night. You can lock in Thursdays for the rest of the Nippers season as we are planning to continuing holding the draw on this night. Just a reminder, eligible members need to be present to win. https://i0.wp.com/semaphoreslsc.com.au/wp-content/uploads/2019/02/Members-draw.jpg?fit=295%2C171 171 295 Kate Newman http://semaphoreslsc.com.au/wp-content/uploads/2014/02/picmonkey_image-1.jpg Kate Newman2019-02-19 21:05:342019-02-19 21:05:46Members Draw Jackpots! This Saturday evening February 23rd, we are holding a 60th Birthday party upstairs in the Bar/Bistro area from 7.00pm. The following Saturday March 2nd, we are hosting a Wedding Reception with access to the upstairs area being restricted for the day. The Members’ Wet Bar will be open immediately following Nippers Club Champs & we will also be holding a free BBQ after training for the hungry mouths!! There will also be a free raffle after the Club Run/Swim/Run. The canteen will run out of the Training Room before Nippers on the day. We are planning to hold the Club’s Annual Awards Night on Saturday the 15th of June at the Clubrooms. The format of the evening will be returning to a Cocktail Party theme as it was until recent years. More information will be provided on this night as we get closer to the date. Please put this date in your diary. Fabulous food and an amazing view. What more could you ask for?! The return of the Members Draw last week resulted in a jackpot for this week of $550. This week’s Draw will be held on Thursday night at around 7pm. Remember members must be present to be eligible to collect the prize. Happy Hour drinks prices between 5-7pm. See you there!